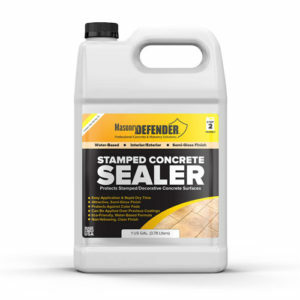 If your stamped concrete patio needs to be re-sealed, and the concrete stain is still in good condition, then applying another coat of sealer will keep it protected and prevent color fading and an uneven appearance. Re-sealing stamped concrete patios can be accomplished in five simple steps. Concrete surfaces need to be clean and free of grease, dirt, paints, waxes, and other surface contaminants prior to staining. To clean the surface, use a neutral cleaner, such as Neutra Clean from Kemiko (www.kemiko.com) or Natural Citrus degreaser by Wepak. Follow all manufacturer directions for cleaning. The staining process is most easily completed with an airless, HVLP or garden variety pump-up type sprayer. Select a proper concrete dye for your project, such as Smith’s color floor. To achieve the desired color, multiple colors of stain may need to be applied to the surface. Follow all manufacturer’s directions when applying a stain. After cleaning, the surface must be allowed to dry completely. 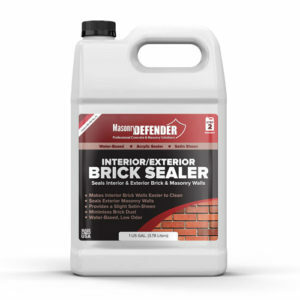 Application of a sealer on a damp surface can result in a “blushing” effect, where the sealer takes on a cloudy appearance as moisture becomes trapped inside of it. 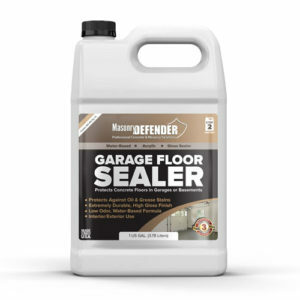 Seal the patio with two coats of MasonryDefender® Stamped Concrete Sealer per label directions. 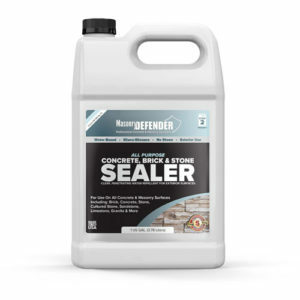 The sealer can be applied using a brush and roller or by spraying with a garden variety pump-up type sprayer. Avoid puddling or “ponding” of the product. Allow adequate time between coats (1-2 hours) for the sealer to completely dry before applying the second coat. The sealer must be applied within four hours. After four hours of cure time, the sealer is too hard to bond to. Allow a minimum of four hours before subjecting the surface to foot traffic. Full cure of the sealer is achieved within three to four days. When the surface of the patio begins to exhibit a dull or uneven appearance, apply a single maintenance coat of sealer. 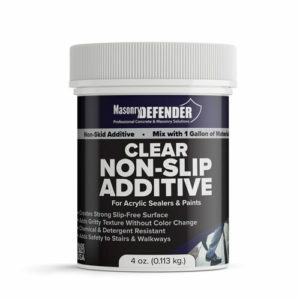 When applying a maintenance coat, clean the surface, as described in step one, allow the patio to adequately dry, and apply a single coat of MasonryDefender® Stamped Concrete Sealer as described in step four.